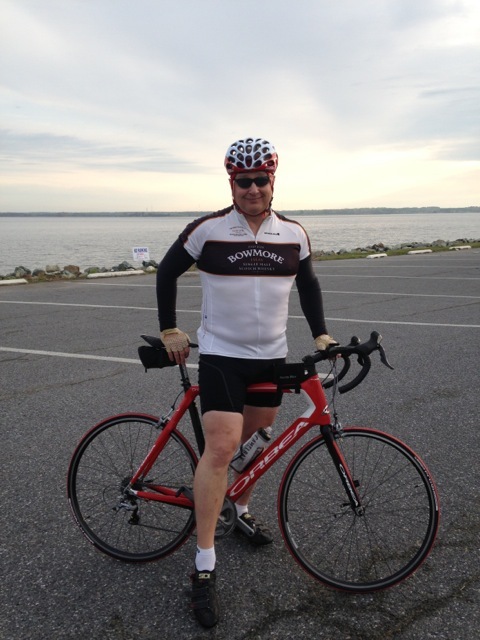 Today’s ride: The 6 Pillars Century in Cambridge MD. This is one of my favorite rides, because of the landscape we ride through. This ride goes through the Blackwater Wildlife Refuge, and there are views of the Chesapeake Bay, not to mention all kinds of waterfowl and other birds like Ospreys, Herons and Red Winged Blackbirds. The landscape is tidal marsh and some farmland. The ride is flat as a table top, with the only thing that approaches the definition of “hill” being bridges. With that said, wind can be a big factor on this ride. Flat rides don’t offer you much variation in terms of position on the bike, so fatigue of feet, seat and hands can be a problem, but this ride has such spectacular scenery that those things really don’t matter. This ride is a feast for the eyes. It is held on the first weekend in May, and for me it’s usually the first important local event of the year. The Experience: It was a perfect cycling day, cool but not cold, the wind wasn’t too bad except for the area of Hooper’s Island (where you can expect it) and the end of the day when it picked up a little. We started out well, perhaps even a little faster than we might have liked, but we were remarkably consistent all day. We had some riders who were rock steady and strong all day – Tom Roman, Matt Birnbaum, and Ron Tripp leap to mind. Eric Sanne and Carmen Legato held on despite worries about their preparation, and John Koehnlein was ticking the pedals over in a slow rhythm that was hypnotic. Carol Linden as in and out with us between rest stops, and the team of Bill Harback and Denise Teeling were driving the early pace like heroes. Most of us were consistently riding about 18-20 mph all day in a long line. The riders around us were great. We were humming along passing riders, and we would warn them we were coming, and thank them as we passed. I found myself occasionally saying “Thank you, thank you very much” in my best Elvis voice as I rode past, just to make it a little more surreal. The last 20 miles were fast – at a time in the ride when we usually slow down, we actually got faster. Holding on to the pace was tough. Tom Roman had a huge hero pull for our line in that section of the ride, and after he set the tone for us, we held together in unison like a single living creature. The after ride celebration was full of laughs, with music courtesy of Matt Birnbaum, beer supplied by just about all of us, and smiles until our faces were in danger of breaking. 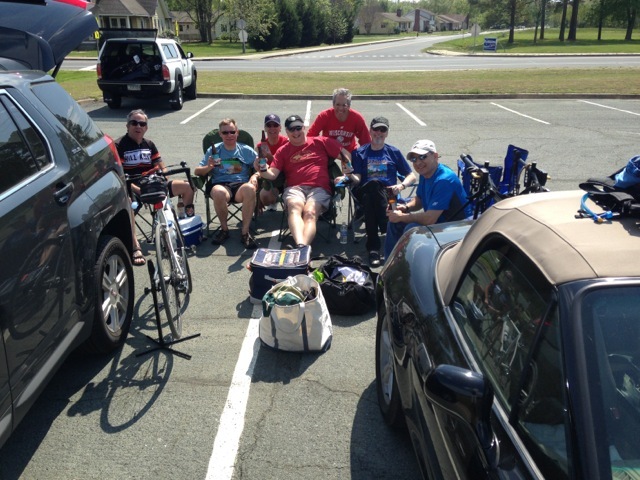 We invited a couple of riders who parked nearby to join us, and they turned out to be from the Reston Bike Club. They were glad to share beer and stories with us. Happy is contagious. Selections from my mental iPod during the ride: “Johnny B Goode” by Chuck Berry, “Eastern Bloc” by Thomas Dolby and “Poets” by the Tragically Hip. Stats: 100.27 Miles ridden, plus a little extra riding to and from the cars. A strong ride from start to finish. The kind of feeling you want to bottle and save to use over and over! 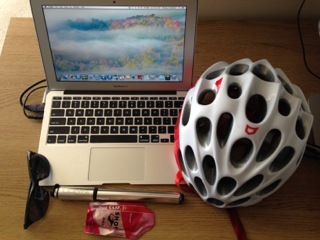 This entry was posted in Cycling and tagged Cycling on May 18, 2014 by kitefencer. didn’t make this ride this year. maybe next year. 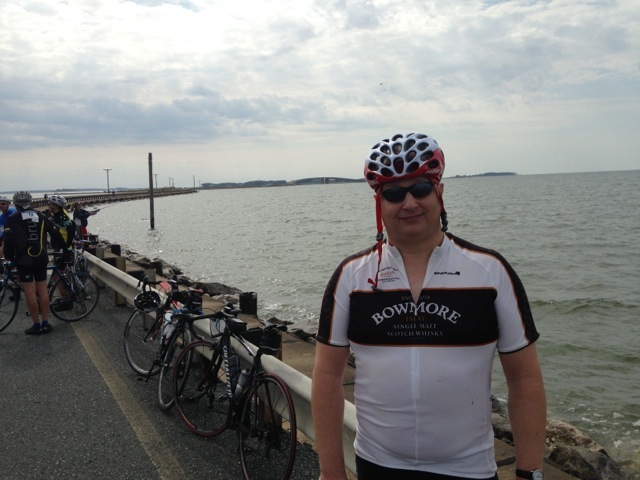 last year, i rode the 36 mile option which i felt was a good choice for somebody who doesn’t have a lot of base miles. it’s a wonderful ride. i remember one section of the ride where the 36 miles route turned off from the route of the other mileages. i could see about a mile ahead of me & behind me. there wasn’t a soul but me on the road. that’s where you have to really believe in yourself & know that yes, i did make the correct turn & i’m on the right route. shortly after that, i passed a small house with a pasture that was nothing but buttercups glowing yellow in the sun. it’s those moments that make riding worth it.